Of the many special reasons to live in the Lowcountry, a sunset boat ride with friends ranks right at the top of the list! 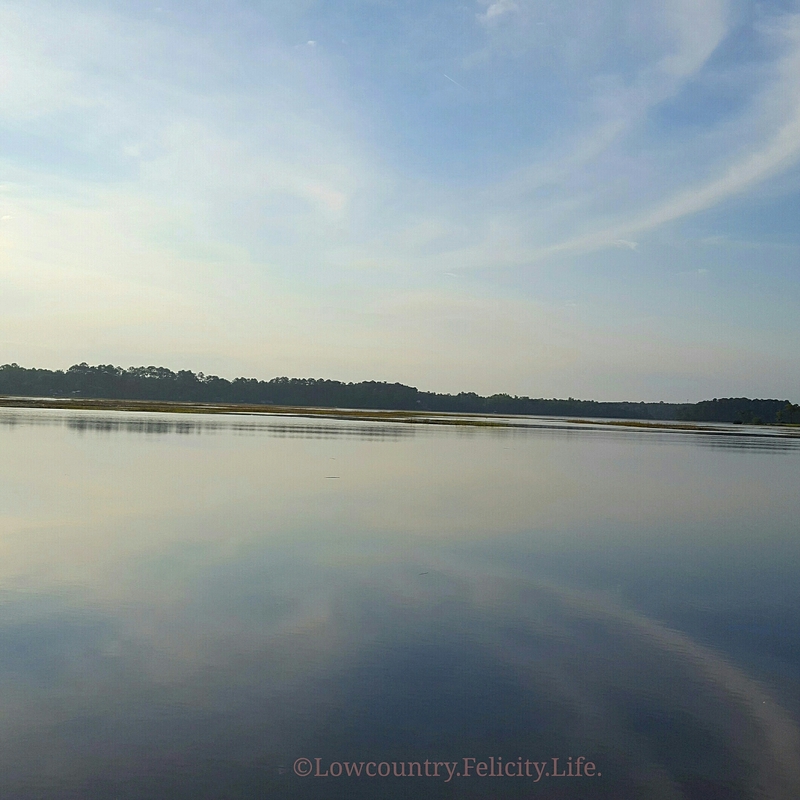 Cruising the Chechessee creek, Colleton and Okatie rivers up to the Port Royal Sound at sunset is a wonderful experience. At sunset the waters were like glass reflecting the beautiful sky. At this time of day dolphin come into the creeks and rivers to feed. Scanning the water, with expectant hopes of seeing them, is a ritual. The evening spent with friends Casey and Ray was made more special because it was a ‘silent auction’ purchase and contribution to the Callawassie Island Garden Club. Friends Cheryl and Bill offered a ‘sunset cruise’ complete with onboard snacks and beverages of the adult nature (of course) followed by dinner and more adult beverages! This had all the hallmarks of a win-win experience. Make a contribution to a worthy cause and spend an evening with great friends! Mr. Ed and I have decided that we are going to use the ‘silent auction’ event strategy for most of our charitable giving. Our recent adventures of this kind included events hosted by the Port Royal Sound Foundation and Heroes on Horseback. It is a great way to have an enjoyable evening and support worthy causes. It is so much more enjoyable than just writing and sending a check! Nice! A win-win for all. Thanks for visiting and for your lovely comment! Love the Chechessee creek, once John snd I kayacked and got lost lol, it was not fun, 4 hours later we found our way to land. The tidal creeks are special in so many ways. Being in a kayak so close to the water is so fun, especially if dolphin are around. You’ve definitely got to be aware of the tides!